Buffalo holds a special place for Dominik Hasek. Over nine seasons he set franchise records and established himself as one of the all-time great goaltenders in National Hockey League history. But at Friday morning's press conference, he was asked if he truly was retired. The Sabres, after all, could use a goaltender. "I know the Sabres, they donât do so well this year. Of course I follow whatâs going on and like Iâve said before, the Sabres stay in my heart so I know whatâs going on and with the changes and how they do however like I said, thank you but no thank you." 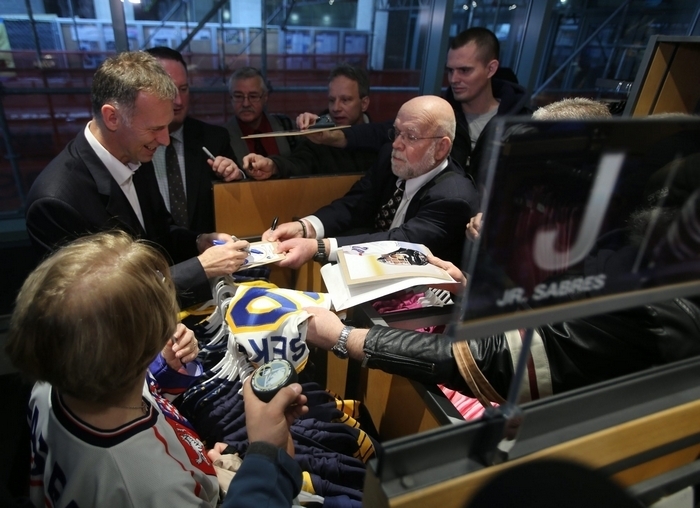 Hasek will be inducted in the Buffalo Sabres Hall of Fame before Saturday's game against the Tampa Bay Lightning. The team announced today that it will retire Hasek's No. 39 sometime next season. He owns the best career goals against average (2.20) and save percentage (.922) among goaltenders with at least 500 NHL games played. He was the first goaltender in NHL history to win the Hart Trophy twice (1997 and 1998). He won six Vezina Trophies. But the awards, the hall of fame the pending jersey retirement, those are things which humble Hasek. "It is very nice and I appreciate it, however there are new goals in life and always something new to prove," Hasek said. "The hockey career is something behind me. What great years, what fantastic things to do something you enjoy, you love to do and be very well paid and be around people you love and spend great time with. However every professional player has to retire one day. You wake up and you enjoy life in different ways."